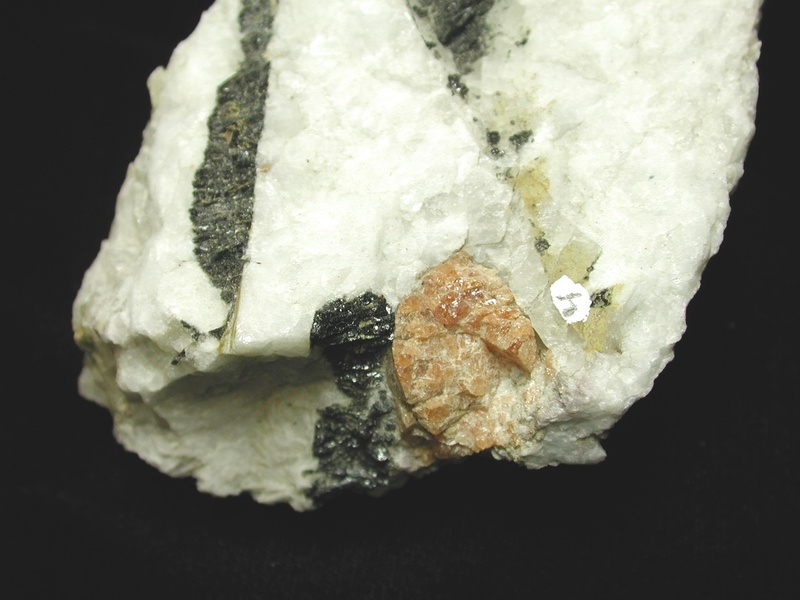 Spessartine #4 from the Himalaya Mine, California. Spessartine #1 from the Himalaya Mine (near the contact with the host rock). The garnet is 6 mm across. The hydroxide contents of spessartine-almandine garnets from the Rutherford #2 (Virginia), Himalaya (California) and George Ashley Block (California) pegmatites were determined by infrared spectroscopy. The hydroxide content of garnet increases from the wall zone to the core zone of the Rutherford #2 and Himalaya pegmatites, consistent with increasing H2O activity during pegmatite crystallization.However, the absolute OH contents differ by about two orders of magnitude for these two suites of garnets, possibly due to the elevated Ca content of the Rutherford #2 and the differences in the depth of emplacement. 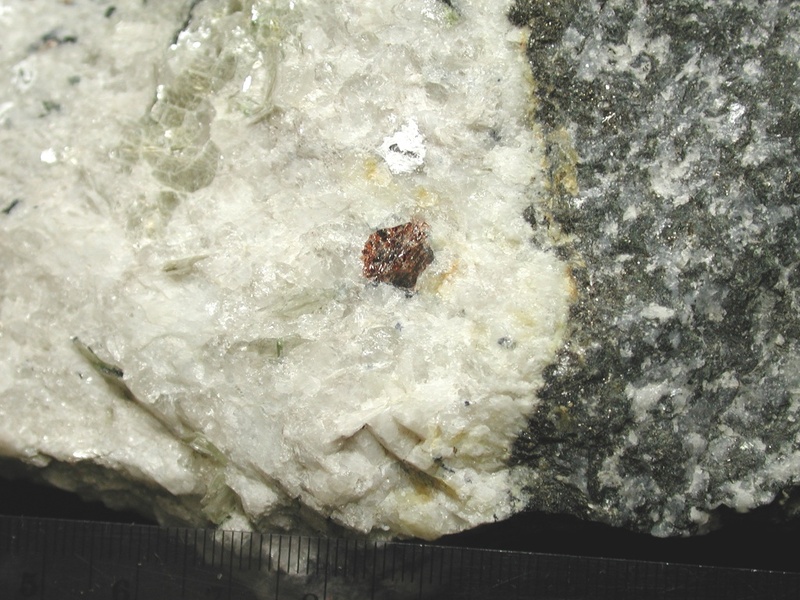 The garnets from the George Ashley Block show significant excursions from this correlation at the positions within the pegmatite where Kleck and Foord (1999) identified disruptions in major- and minor-element trends that they associated with re-injections of magma and subsequent flushing of the dike system. Ease of measurement as well as a relative amplified sensitivity compared to the Mn and Fe trends, make hydrogen an excellent tracer for the evolution of granitic pegmatites. Figure 1. Composition versus sample position for the Rutherford #2 garnets. Figure 2. Composition versus sample position for the Himalaya Mine garnets. Figure 3. Composition versus sample position for the GAB garnets. Figure 4. Rutherford #2 garnet OH absorbance. Figure 5. Himalaya Mine garnet OH absorbance, 1) 5 mm from wall contact, 2) 40 mm from wall contact, 3) near intermediate zone, 4) near pocket zone. Figure 6a. GAB garnet OH absorbance 0-330 cm (wall to core). Figure 6b. GAB garnet OH absorbance 420-810 cm (core to wall). Figure 7. Rutherford #2 garnet wt% H2O vs. sample position. Figure 8. Himalaya Mine garnet wt% H2O vs. sample position. Figure 9. GAB garnet wt% H2O vs. sample position.